Lyra Pencils make interesting and often innovative ranges of graphite and colour pencils. World famous for their Ferby & Color Giant ranges which have long been accepted as one of the best pencils around for all artists and especially children as their shape makes them easy to hold. Also available are the highly lightfast Aqua Brush Duo brush pens which are great for any illustrations as well as several ranges of graphite pencils, graphite crayons and may accessories. These great packs of Lyra Color Giants - Skin Tones are in special skin tone colours. This will enable you to sketch and colour any shade of skin with ease. The Lyra Rembrandt Aquarell Watercolour Pencils are watercolour pencils made from the finest pigments with excellent lightfastness and brilliance of colour. Blend with a brush dipped in water to create many different effects. 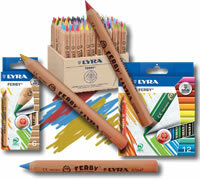 Here we offer the superb range of traditional sketching and drawing pencils from Lyra. The Lyra Rembrandt Sketching Range of Pencils include a full range oil based and chalk based sepias, sanguines, white and black pencils. 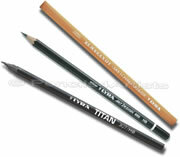 Lyra offers several ranges of high quality, artists' graphite pencils. Including the Lyra Rembrandt Art Design Pencils, Lyra Titan Graphite Sticks and the flat Lyra 874 Sketching Pencils. These pencils are ideal for all art, sketching and designing. Lyra Graphite Crayons are chunky, hexagonal sticks of solid graphite 12mm in diameter. Ideal for drawing and sketching, especially for people who find a larger grip more comfortable to use. Both watersoluble and non-watersoluble versions are available in 2B, 6B and 9B. 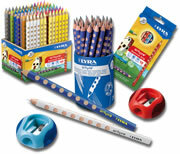 For this section we have selected several of the pencil accessories from Lyra. Including the Lyra Splender Pencil, a, colourless blending pencil, sharpeners that fit standard pencils as well as larger gauge pencils such as Lyra Color Giants and Lyra Graphite Crayons as well as the ever poular Lyra Pencil Holder. Lyra Aqua Brush Duo is brush pen with a broad tip on one side allowing for brush like techniques and a fine liner on the other it is ideal for all kinds of illustration. The tips are extremely strong and do not fray. The ink is waterbased, can be blended and has great lightfastness. 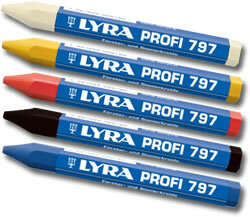 Lyra Profi 797 Marking Crayons will mark just about any surface - wet or dry lumber, hot or cold metal, stone, concrete, rubber, car tyres and pretty much anything else! They last a longer than ordinary crayons and are waterproof and fadeproof.